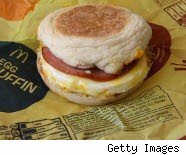 Would you pay a nickel more for a cage-free Egg McMuffin? A McDonald's Egg McMuffin is so cheap, about $1.30, that you'd think that a small price increase wouldn't be a problem for consumers. Even a whole nickel. But McDonald's must think it is, because it recently decided not to have 5% of its eggs come from cage-free chickens. The American consumer must not think an organic McMuffin is worth the extra cost, according to McDonald's reasoning. Even if that cost, by my calculations, would be 5 cents per sandwich, or maybe even less. Is an inexpensive breakfast worth a premium price so that you can feel good about the environment and how that breakfast is made? I don't know the numbers McDonald's has come up with for how much it would have to charge to get eggs from chickens with a little more room to spread their wings, but with cage-free eggs costing about 60 cents more per dozen on the wholesale market, getting such an egg on a sandwich should cost about a nickel. Maybe less once more suppliers offer them and McDonald's uses its sizable purchasing power to buy millions of the eggs at a discount. The company's board of directors said that the scientists don't agree on "how to balance the advantages and disadvantages of laying hen housing systems." But a senior director of the Humane Society's factory farming campaign pointed out to the New York Times that McDonald's has committed to going 100% cage-free by the end of 2010 for all of its European operations. Consumer demand for cage-free eggs must be higher in Europe than it is in America. The European Union will ban conventional small cages in 2012. Most organic products cost more than non-organic, and it can be a personal choice if it's worth the extra cost at the grocery store. For my money, any organic fruit or vegetable that has a thin skin tastes better. Organic bananas are a ripoff because it's unlikely that pesticides would penetrate the thick skins. I've eaten organic beef and chicken, and they taste better than traditionally raised beef or chicken. Same with organic eggs and milk, at least for my money. Like the bananas and avocados, some organic produce isn't worth the extra cost and is like buying something with a brand name instead of the cheaper generic brand. Finding organic produce is becoming easier as more people have asked for it. Until more Americans decide that they want cage-free eggs, the Egg McMuffin and its daily allowance of cholesterol will continue to be a cheap and yummy breakfast -- not a nickel more.